Readers Question: There are around 22 million households in the UK, 2/3 of whom own their house. So the rental market would be around 7 million of whom one million receive benefit, some portion living in social housing, some in private rented housing. Does that seem reasonable? Can you point me towards actual numbers? The aim of housing benefit is to help those on low income afford their housing costs. It is particularly important for areas of high housing costs, such as London. Without housing benefit, there would likely be a shortage of workers because people would have to move away to cheaper areas. Housing benefit helps to reduce inequality and relative poverty by helping people with their major living costs. Housing benefit can help avoid homelessness by giving people help with housing costs. Housing benefit can be claimed with other benefits, such as unemployment benefit and tax credits. 1.28 million are over 65. The biggest area for receiving benefits was London with 835,000. The great recession of 2008-2014 saw a marked rise in the numbers eligible for housing benefit. 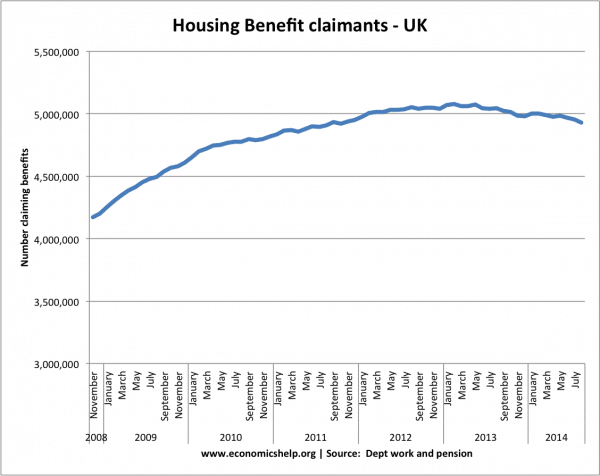 The numbers claiming housing benefit peaked at just over 5 million in early 2014. In Aug 2014, 4.93 million received housing benefit. Fall in real wages causing more people to be eligible for income related means tested benefits. Rise in unemployment during the great recession, which significantly reduces income. 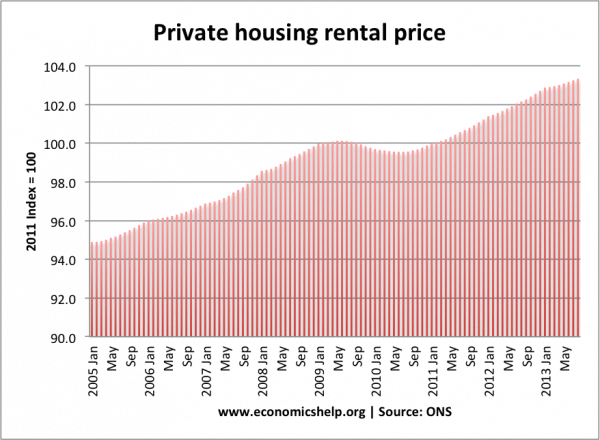 Rise in cost of renting during this period. 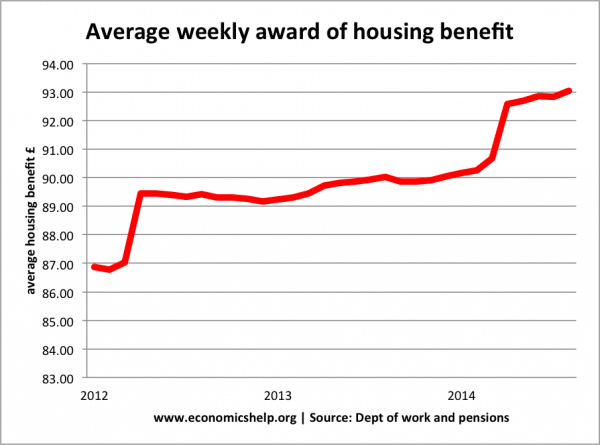 The average weekly award for housing benefit has increased to £93 a week. By comparison job seekers allowance is £72.50 for people over 25. For those in the private rented sector, the average Housing Benefit is £107.28. Housing benefit is one of the largest components of social security payments. 4.93 million * £93 average spend = £458 million per week = £23.8 billion annual bill in 2014. Readers Question. What would happen if the housing benefit stopped completely? The five million claimants would still need to live somewhere. The landlords would still need income from somewhere. Would overall rents go down or up? It would cause a real upheaval if housing benefit was stopped. Some would be able to afford housing by cutting back on other expenditure. But, at an average of £93 a week, that is very significant part of disposable income. Many would be unable to afford their rent. I think you would see a fall in rents. Many landlords would accept a lower rent rather than lose their tenants. However, others would be evicted. With strong demand, some rents could prove ‘sticky downwards’. Landlords in London probably could find that they could keep charging high rents. It was interesting researching housing benefit because I wasn’t exactly aware of how significant this benefit is. To be honest, I’m almost shocked at how many people are eligible and the total overall cost. With nearly 5 million and an average annual budget of close to £23 billion – that is of major significance to the housing market and overall equality and living standards in the economy. It also is an indication of the high cost society pays for expensive housing, limited supply and a reluctance to increase the supply of housing in the UK. The problem is that I would forecast in the long term, housing benefit is likely to increase because the number of households is likely to increase faster than the supply of affordable housing. Private landlords will benefit substantially. It is ironic that this is a means tested benefit aimed at helping people on low incomes, but the real beneficiaries are those private sector landlords who benefit from inflated rents and a government propping up the renting sector. Also a major cut in housing benefit would have a significant impact on consumer spending and aggregate demand. People receiving housing benefit will have a high marginal propensity to consume because they have limited disposable income. A cut in housing benefits would save the government money, but lead to a fall in total demand. This entry was posted in housing and tagged housing. Bookmark the permalink. ← Is the younger generation worse off than their parents? Thanks for the quick response and statistics….23 billion! wow! I received one of the government letters showing how taxes are spent but it does not show a breakdown of welfare which is rather unhelpful. 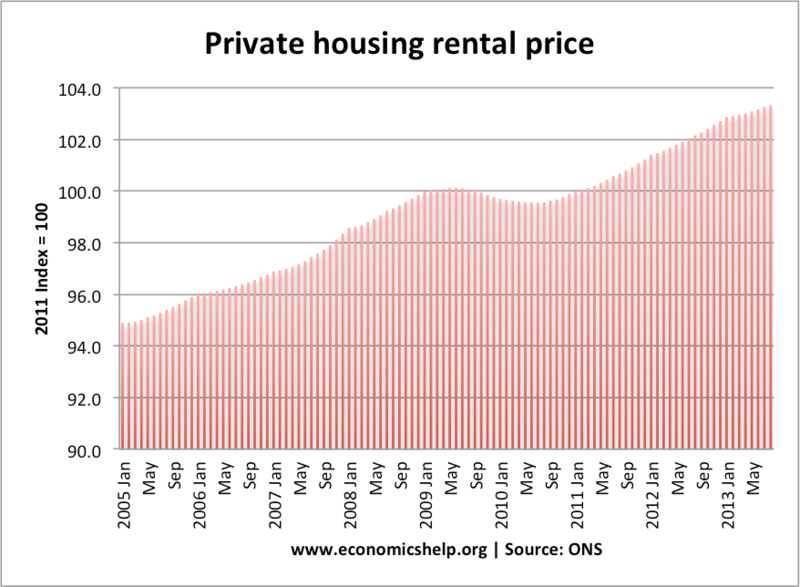 But London rents are not inherently high. They are high because there is high demand for a fixed stock. In part that is because housing benefit gives people more to spend on rent (or maybe other things, because they use less of their own money to pay rent). If people were forced to move out, either others would move in or the supply demand balance would shift and rents would be lower. Given the nature of supply, it is roughly vertical (the stock is fixed, in the short/medium term) small shifts in demand can have large price effects. Do subsidies help? If there is a lack of housing, no amount of subsidy will help. It will push up prices. If there are 11 people looking for houses and there are only 10 houses, one won’t get one…the prices will rise until one can’t pay the price. If that one is subsidised, so s/he can outbid the others, that must mean a higher price. Now the one who is elbowed out needs support, to raise prices even higher. The only answer is another house or less people. For every person sunsidised into a house, another is subsidised out.